started doing pitching lessons,” Hutton said. “Everything built up from there. I would go to practice, then to pitching lessons and then I started playing club ball and then competitive ball.” When she reached high school, it started to become clear that she could have a future in softball and could play in college. Have you recently overheard something funny on campus? Put your eavesdropping to good use. Tweet us @CSUCollegian and your submissions could be featured in our next paper! er hours and hours of time in investment by finding the customer first,” Mitchell said. cy: solar installation, energy efficient updates to houses and the financing of any changes. “James is a believer in the greater good and he has been an advocate for the green movement and he adds a lot of value,” Scherer said. Renewablue has plans for expansion in the future. They plan to partner with a solar energy co-op that is coming to Fort Collins in order to be able to expand their services. “Right now the services that are offered are solely for individual homeowners, but with a partnership, there is the potential to build co-op purchasing power into a neighborhood,” Mitchell said. Corbin Reiter can be reached at news@collegian.com. that are LEED certified, but only a handful that are LEED Platinum. CSU Facilities Management has jurisdiction over many of the points of rating outlined within the STARS form. Programs and initiatives originating in their department have the largest impact on the STARS rating for CSU. CSU operations and improving the STARS rating in the process. “A strategic plan is a long term visioning document, not a detailed action plan,” Dollard said. “So we set goals in a strategic plan, then have to do additional work to figure out how we implement projects to meet those goals.” The strategic plan is specifically addressing the sustainability culture within individual departments, along with the reduction of water and electricity. These proposals have been met with a quantifiable change in recent history. CSU sustainability. There are currently several projects being designed to address carbon emissions on campus and to continue to improve CSU, Dollard said. 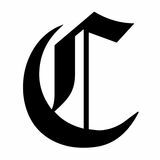 “CSU has set the goal of 100% renewable electricity by 2030 — since that category is half our GHG (greenhouse gas) footprint, it will reduce our GHG emissions by 50%, but we have a decade to accomplish that, so you won’t likely see drastic reductions in any one year,” Dollard said. Corbin Reiter can be reached at news@collegian.com. where they are held, but Kimble said they would like to make them more accessible to people who want to attend. The next event will be a Pizza with Police event held later in April, she said. “I’d encourage people to come, even if it’d be a little uncomfortable or weird,” Feit said. “I think that they’d be surprised how laid back and how normal we all are.” Ravyn Cullor can be reached at news@collegian.com. and on the brink of being demolished, Napoleon saved the building and crowned himself Emperor inside the cathedral in 1804. The building was once again threatened during WWII when it was feared German soldiers may destroy stained glass that was newly installed in the restored building. The glass was removed and reinstalled after the war had ended. Dubbed “our lady,” Notre Dame is still used for Sunday Mass by the Roman Catholic Church and is the seat of the Archbishop of Paris. Anne Hidalgo, Paris’ mayor, shared the news of the “terrible fire” and shared officials were trying to control the flames. Emmanuel Macron cancelled a planned speech to the country to go to the burning cathedral an Elysee Palace official told BBC. Macron shared his sympathies on social media for Catholics and the people of France. President Trump said the fire at the cathedral was “horrible to watch” and suggested “flying water tankers could be used” to extinguish the fire. “Must act quickly!” Trump tweeted. Content Pulled from News Tribune Service. The top Republican on a House committee investigating voter suppression told election officials in Kansas, Georgia and Texas that the committee has exceeded its authority with information requests sent to those states. Rep. Jim Jordan, R-Ohio, the top Republican on the House Oversight Committee, sent letters Monday to election officials in the three states that described the Democratic-led investigation as partisan and beyond the bounds of Congress’ oversight power. Jordan’s letter comes after Rep. Elijah Cummings, D-Md., the House Oversight chair, sent records requests to election officials in the three states last month. The committee plans to look at at least four or five states, and could subpoena witnesses in its probe of possible voter suppression. Georgia residents, mostly minorities, a few weeks before the election. Kemp denied Democrats’ assertions that this was voter suppression. Cummings, Raskin and other Democrats want to know more. They have asked Georgia officials to provide “all communications related to any voter roll purges,” as well as “all documents related to your ethical or legal obligations or possible conflicts of interest while simultaneously running for governor and overseeing the state’s elections as Georgia’s secretary of state.” Jordan’s letters to the Georgia officials are nearly identical to the ones he sent to the officials in Kansas and Texas. The Democrats sought documents from Texas officials detailing reported efforts to toss possible noncitizens off voter rolls. Cummings and Raskin wrote on March 28 that they were “disturbed” by accounts that Texas officials have “taken steps to remove thousands of eligible American voters” from state rolls. And, they said, many have been referred for criminal prosecution “for exercising their right to vote.” Texas Attorney General Ken Paxton’s office responded last week that the oversight committee “lacks any oversight jurisdiction over constitutional officers in the State of Texas.” Content pulled from Tribune News Service. “It makes you give up on life as I have without her,” he said. Among the records were reports from deputies involved in the case, including those who discovered the bodies of the Amatos and others who spoke to friends and neighbors of the family. his home to pay for Grant Amato’s legal expenses and debts, the relatives told detectives. When Chad discovered Grant Amato was in the process of taking out a line of credit in his name without permission, they said Chad Amato allowed the application to proceed “because he did not want Grant to get in trouble for fraud and wished to protect him.” A co-worker of Chad Amato’s at CVS Health said he worked two jobs and was “very proud” of his sons. Chad and Margaret Amato planned to work a few more years before retiring to Tennessee, the colleague said. She described noticing that Chad was tired and stressed from working two jobs and dealing with his son’s issues. Amato’s attorneys argue that no physical evidence ties him to the killings. He was denied bond during a hearing in March, but he will appear in court again April 25 to determine whether he is eligible for pretrial release. Amato has pleaded not guilty to the killings. Content pulled from Tribune News Service. talented, brilliant, creative people think they’re not because the thing they were good at at school wasn’t valued.” Everyone is good at something. Oftentimes that something is a form of art, and society not taking advantage of everyone’s individual talents is a sad statement about the world we live in. think the fundamental principles on which we’re educating our children,” Robinson said. We tell children who find value in and attachment to creative activities that they will never get a job doing that thing. Even if the job market has few openings in the arts, why do we paint the world that way for our youth? Our world is one in which all art forms must take a higher stance. This is not to disparage STEM studies — they also help us understand life — but to realize how important innovation and individuality are in a world that needs their influence. “We have to be careful now that we use (the gift of the human imagination) wisely ... ,” Robinson said. “And the only way we’ll do it is by seeing our creative capacities for the richness they are and seeing our children for the hope that they are.” Renee Ziel can be reached at letters@collegian.com. The Ra ft Guide Life By Trigg Skoe We wake up and find ourselves searching for the least smelly set of clothes, grab either a coffee or a Red Bull and force that smile before the first round of happy-go-lucky customers arrive. From the drunken group of guys on a bachelor party to the timid foreign family, we have experienced it all. We always hope for the strong, light group of fun people, but are usually stuck with the opposite. Guiding is a great job and it brings along with it a community you won’t find anywhere else. We spend our days on the river and get paid to do it. For many of us this is what keeps us coming back. Many guides go on to become teachers and engineers and guide in their free time, but there are also many who find themselves searching for water turning guiding into a career. Don’t get me wrong, raft guiding is a blast, but until you are going through a class IV rapid while trying to rescue a 300 pound man, with his three kids, and a flipped raft, you haven’t experienced panic. I think a large misconception of rafting is that the job is all fun and no work. It is a lot of fun, but there are other factors that aren’t so much. So, before you sign into a training program for a raft guide position, make sure you are ready for some of the craziest times of your life and a passion that will last a lifetime. SPONSORED CONTENT New Years means something different for us all. For me, it meant joining 105 other people, all layered in drysuits on top of fleece, on the frigid waters of the Colorado River. For many of the kayakers and rafters this was a new event, but for others, this is an annual event. A few of the participants were even on their 7th year. I think that celebrating the new year with kayaking was the best way I could have celebrated it. Instead of waking up hungover, I got to bring in the new year with some amazing people doing an activity that I love. It’s not for the faint of heart, but if you think you can put up with the cold and the rapids, check it out for January 1, 2020! When we got off the river I looked down and saw a sheet of ice covering me. We had to pour hot water on my life jacket to melt the ice so I could take it off, and it took two people to pull off my boyfriends’ life jacket. Luckily, we were greeted by hot chocolate and hand warmers at the take-out. The river is never safe, it seem s that each year at least one person looses thei r life, please take the hazards serio usly. This year was my first time participating in the Shoshone New Year’s Day paddling. When we first got to the put-in, I thought we were crazy. It was 15 degrees, there was snow on the ground, and I was about to get into the river. To put-in, we slid down the snow covered rocks in our kayaks, which proved to be both chaotic and fun. When we got onto the river, the feeling that we were crazy was confirmed. It was cold, I was covered in ice, but I couldn’t have been more happy. Everyone was so ecstatic to be on the river, with the exception of the two people that swam. Everyone shoul d wear a PFD, not just weak swimmers. On New Year’s Day a group of boaters all meet outside of Glenwood Springs to boat a section of the Colorado River called Shoshone, a Class II and III run. This tradition is a great way to bring in the new year and maybe even shake off anything from the night before. The Poudre River upstream from Gateway Natural Area shoul d only be floa ted in a boat, it is not safe for tubing. is advised with any tubing excursion, especially long-distance ones, to take two cars and park one where you enter the river and another at your end spot. This way everyone can avoid a long trek with their tubes and gear. Although there are always risks when tubing, it is advised to avoid the river in early summer. April-June can be dangerous months due to the runoff creating a fast-pace of the river and possible cooler temperatures. For this summer, with the large snowpack runoff is expected to be high so avoid the river until mid June. Popcorn, giveaways, and friendly competition for all in the Fort Collins community! hours, it’s still going to run you about $100,000,” Watson said. “I know all of this college knowledge already exists on the internet for free, but if you want an arbitrary, pricey piece of paper from CSU that will eventually prove virtually nothing to all prospective employers other than the fact that your parents can afford college, well, it’s going to cost you.” Many students gave nods of approval towards the new program. “I just like that CSU finally owned up to the fact that a person can gain the equivalent of a college degree with a couple of hours and an internet connection,” remarked TED Talks major Izabella Martinez. She went on to say that her favorite part of the program was the aforementioned “random Wikipedia article” section. “It’s like, am I going to be learning about nuclear fission or Republican Dan Benishek?” Martinez asked. “At the same time, who the hell really cares? I’m just going to go push grocery carts at a King Soopers when I graduate anyway.” Marshall Dunham can be reached at letters@collegian.com. my privilege on this campus, but I also recognize that because of my identities, I have an opportunity to say the things that are not often listened to, even if I am not speaking on behalf of myself. sues affecting white people but failing to acknowledge racism at all is another way of saying the issues that affect white people deserve the most attention and discussion. A possible way to counter this problem may be more simple than it seems. Rather than plastering posters all over with the principles of community, using the words “diversity and inclusion” like they are concretely defined, or creating more generic slogans, we should just ask people to not be racist. Rather than just saying “No Place 4 Hate,” we should also say “no place for racism,” because clearly we need to be reminded. It doesn’t take a lot to do these things, and it doesn’t mean we have to forget about other marginalized groups. All it requires is to recognize the privilege of white people and for once think outside of it. That is not a lot to ask. Katrina Leibee can be reached at letters@collegian.com. When a project is going to take you WAY longer than expected. The Notre Dame Cathedral burning. Getting a sad phone call that ruins a good day. Being cold all the time especially when the weather is warm. The futility of trying to start new projects at this point in the year. of something special. She had confidence and experience on her side, which helped her start to come into her own. “Junior year I felt this overall strong mentality about myself, and I learned a lot through Coach (Dedeann) Pendleton-Helm and how to get stronger mentally,” Hutton said. “I started doing visualizations to help the mental side of my game. I knew I had the physical part, but the mental part was holding me back.” As her final season began, Hutton became a leader on the team, and she knew that there were great things in store for this season. “This team is so special, and I felt that coming into our fall season,” Hutton said. “I knew that it was going to be different this year because it was kind of a change in mentality. We needed to be strong mentally and know that we can do this. It’s been super fun with this team. We’ve shared some great memories this year and accomplished so much, and I couldn’t be more proud of this team. … Our key components this season are pushing each other, wanting to get better and wanting to learn more.” As one of the leaders of the team, Hutton has contributed mightily to the Rams’ best season in 30 years. She’s been instrumental in that success. The team is 13-3 when Hutton is pitching. She has pitched 119.1 innings so far this season, in which she has an earned run advantage of only 2.46 and 75 strike outs. She even threw her first career no-hitter earlier in the season. After nearly four years of strong play, Hutton still credits her family in her success. She said she is grateful for her family and all the support they have given in her career. “My family has meant everything to me throughout my four years,” Hutton said. “Going back in the day to when my grandpa was the athletic trainer (at CSU) for 31 years and my mom and dad met here. … All of us have been here. They’ve supported me no matter what throughout my four years. They tell me to do me and they support me no matter if I have a bad day or a good day, and that’s big. They’ve been my strong suit these last four years, and I couldn’t be more grateful to have played with Haley and to have that support system. Having them by my side has really helped me.” Junior Guerrero can be reached at sports@collegian. com. The new Jack Christiansen Track at Colorado State University saw some incredibly fast times recorded over the weekend at the Doug Max Invitational meet. The meet featured athletes from Air Force, University of Wyoming and University of Colorado, Boulder. It was originally scheduled for April 12 and 13, but was postponed to April 14 due to weather. Once things finally got going, so did the Rams. 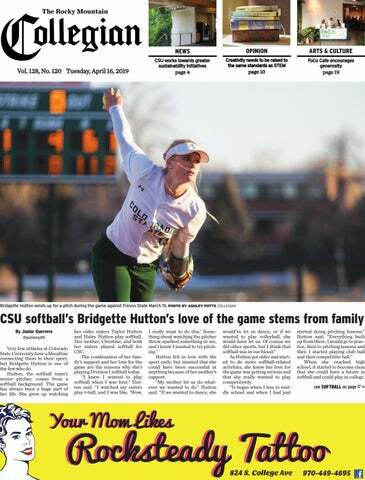 season and put her at seventh all-time at CSU. Nathan Gish and Emma Atwell also set personal records at the meet. Gish won the men’s 200 meter, beating his previous record of 21.5 seconds from last year’s Mountain West championships for a new personal best 21.25 seconds. This puts him at ninth all-time at CSU. Atwell won the 3,000 meter steeplechase event with a time of 1:29.72, now fifteenth overall at CSU. Many other Rams won their events and set personal records at the meet. “There were some good performances across the board,” Bedard said in a press release. “And that’s always fun to see.” The Rams will be on the road for several meets in California this week. Starting Wednesday they will be at the Bryan Clay Multis meet at Azusa Pacific before continuing on to the Mt. SAC Relays, Bryan Clay Invitational, Pacific Coast Intercollegiate and Long Beach Invitational. Ashley Potts can be reached at sports@collegian.com. CB De’Vante Bausby (41) CB Craig Mager (49) G Don Barclay (67) T Ja’Wuan James (70) 2019 Broncos uniform number changes: QB Garrett Grayson (2) WR Brendan Langley (12) CB Isaac Yiadom (26) G Sam Jones (77) Content pulled from Mile High Sports. round-one series tied at 1-1 – largely because of his heroics on Saturday night – MacKinnon is the biggest star in Denver. I remember a night, looking up in the sky and seeing a sea of stars, but there was one that shined brightest. Turns out, it was actually a planet. The point, is, though, you couldn’t “not” notice it. I still remember that night; you just don’t forget the shiniest. And I won’t forget MacKinnon’s overtime winner, either. I’m not sure I’d go with the old cliché “a star was born” because he already was one. It’s just that MacKinnon shined so damn bright. That’s what stars do. Content pulled from Mile High Sports. FoCo Cafe’s first annual Spring Soiree fundraiser presented food and drinks from a variety of different local suppliers, further celebrating their mission of serving and supporting the community. Doing good for those in the community was the central theme of the night, and the spirit of giving back was not only in the air but on the walls. Everyday Joe’s Coffee House, which hosted the event Friday, believes in serving and benefiting the neighborhood through more than just their coffee. community, food and togetherness,” Garneau said. “We wanted it to be available to everyone — so the tickets are a lot cheaper than they could be — but we also offered the opportunity for people to buy tickets for community members that aren’t able to buy tickets themselves.” The concept of paying it forward is deeply ingrained in the cafe’s belief system. When eating at the restaurant, patrons can pay what they can, pay it forward or volunteer for their meals. Being a donation-based restaurant, FoCo Cafe relies heavily on support from its community. gives the community resources like baby items, snacks, dog food and writing supplies; the Hydration Station, which was installed to ensure access to clean water; and The Kindness Cupboard, which provides non-perishable food items to those who may need them. “When we find something good like this that allows people who have a little more to give...it allows people who don’t have so much to still be able to get what they need,” Stein said. “That’s right down our alley, so we’re really happy to be able to support FoCo Cafe.” Lyra Wiley can be reached at entertainment@collegian.com. in her country, she felt the need to start recording everything that she saw about the elections. The film is narrated by Beckermann, who protested against Waldheim’s election. The documentary is told using old, selfshot footage from Beckermann as well as other news clips from around the world. Some of the clips are interviews with Waldheim in where he loses his composure on live TV. legations. He would even get his American son to support him to make him look like a typical family man. Despite the allegations against him, Waldheim would go on to become president of Austria. Many people around the world felt that he was the best president for a country that was still preaching hate. Waldheim shows that his charisma and the way he carries himself was enough to be elected. Waldheim would be put on the United States watch list and would not be allowed into the country after being elected. ACT festival programmer and coordinator, Scott Diffrient, praised the movie. “(‘Waldheim Waltz’ is) one of the most fiercely intelligent films I’ve seen in awhile,” Diffrient said. Overall, “Waldheim Waltz” is an important reminder of how hate will rise and it is important to look out for the signs. Not only is it important to set yourself up but to also hold these politicians and people trying to get power accountable for their past so history cannot repeat itself. Dominic Brazeau can be reached at entertainment@ collegian.com. Tuesday, April 16 The Aggie Theatre is hosting Drake Bell at 8 p.m. Drake Bell’s eclectic pop sound won’t be reminiscent of the TV shows he starred in, but rather a stream of emotional confessions that cover the highs and lows of his mind. His sound reaches high energy moments and makes listeners dance to the rhythm. The Regional is hosting Beni Brosh at 6 p.m. Fort Collins’ Americana, folk and rock singer/songwriter Beni Brosh uses crisp and concise finger picking on his acoustic guitar to lay down sweet melodies that float along with his soaring voice. Beni Brosh’s sound has an inviting nature that helps create a smooth yet flowing live experience. To tell us what you think for your chance to WIN! Go to Collegian.com/springsurvey/ today to complete our survey for a FREE game card and chance to see a concert this season (a $256 prize!) Give us your thoughts and by completing our quick & easy online survey, you get a FREE game of bowling or laser tag at Chipperâ&#x20AC;&#x2122;s Lanes! Anyone that fills out our online survey will have a chance to WIN a 4-pack of concert tickets & (4) four shuttle passes to any concert this season at the historic Mishawaka Amphitheatre! of the racism and classism that exist within them. For example, the regional hotels can use water without a problem, but citizens can’t have water in their own homes. “Our Song to War” This Belgium short film examines Colombia’s grim 2002 Bojayá Massacre. The film uses beautifully raw shots of the forest to create an attitude and intrigue from the get-go. It tells the story and history of the massacre through the perspectives of the children who lost family members in the tragedy. It explores the ideas of familial loss and healing as a community by using the voices of these children talking about the loss of their family members. “Trapped in the City of a Thousand Mountains” To end the shorts block, this short film discusses the “morally suspect” behavior of the underground subculture in Chongqing, China. Filmmaker David Verbeek shows the censorship laws in China that include the banning of hip-hop and tattoos. The underground club culture in Chongqing gives its residents, especially young, tattooed rappers, a chance to express themselves freely. It looks at the idea of hip-hop culture as freedom and how China is not truly free because the music is not allowed. The film includes shots of rappers rapping in their studio, music videos being filmed and generally young people exploring this as a part of their identity. Maddie Wright can be reached at entertainment@collegian.com. — 8 — Disciplined practice matters with a physical goal. You’re exceptionally clever with communication over the next three weeks, with Mercury in your sign. Express your creativity. TAURUS (April 20-May 20) — 8 — Build a romantic relationship through steady participation. With Mercury in Aries, review the past. GEMINI (May 21-June 20) — 8 — Participate with an energetic team over three weeks, with Mercury in Aries. Your friends are a source of inspiration. CANCER (June 21-July 22) — 8 — Stay involved with your community and networks. Share valuable professional opportunities. Mercury in Aries emphasizes career gain through communications. LEO (July 23-Aug. 22) — 7 — Can you mix business with pleasure? Travel beckons, with Mercury in Aries for several weeks. Make long-distance connections. 9 — Use your power for good. It’s easier to organize shared finances, with Mercury in Aries. LIBRA (Sept. 23-Oct. 22) — 7 — Communication between partners, lovers and allies flowers, with Mercury in Aries. Compromise and negotiate terms. Delegate more. SCORPIO (Oct. 23-Nov. 21) — 8 — Coordinated teamwork leads to success. What you’re learning energizes your work, health and fitness, with Mercury in Aries. SAGITTARIUS (Nov. 22-Dec. 21) — 8 — Charm benefits your career. Express your affection and heart. Put your love into words. CAPRICORN (Dec. 22-Jan. 19) — 8 — Begin a home renovation phase, with Mercury in Aries. Set family goals. Clean house and organize. Release stuff that no longer “sparks joy.” AQUARIUS (Jan. 20-Feb. 18) — 7 — Learn voraciously, with Mercury in Aries. You’re especially creative, and words flow with ease. Write, record and report. PISCES (Feb. 19-March 20) — 8 — Discover new income sources. Track your cash flow for growth. Make profitable connections, with Mercury in Aries. Benefit through communications, collaboration and networking. Visit your local LSC, Lake St Parking Garage and Campus West restaurants. Subway MyWay™ Rewards available at participating restaurants. For catering, earn tokens on in-restaurant orders only. Tokens may not be earned on purchases of gift cards. Subway® is a Registered Trademark of Subway IP Inc. ©2018 Subway IP Inc.